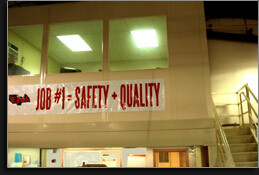 The qualitative requirements of a top-notch machining company are extremely high. The commitment to quality demands continuous research and development to consistently exceed the industry's standards and expectations. The enemies of quality? - apathy and ignorance. FPI machining and inspection personnel are meticulous about craftsmanship. They have gone through extensive and rigorous training in various quality control standards, machining techniques, conventional and computer-aided drafting, and CNC Programming. FPI's inspection center utilizes coordinate measuring machines, optical comparators, surface gages, mobile laptop computer-aided design and inspection, and countless varieties of micrometers, pin gages and calipers to ensure excellence and customer satisfaction.